Shah Rukh Khan, who is co-producing the Abhay Chopra helmed film Ittefaq, which is the remake of the 1969 film of the same name, lent his star power by attending a press meet held in Mumbai Monday. Joining him on stage were the film’s cast – Sonakshi Sinha, Sidharth Malhotra and Akshaye Khanna, along with debut director Abhay. Co-producer Karan Johar was also there hosting the event. 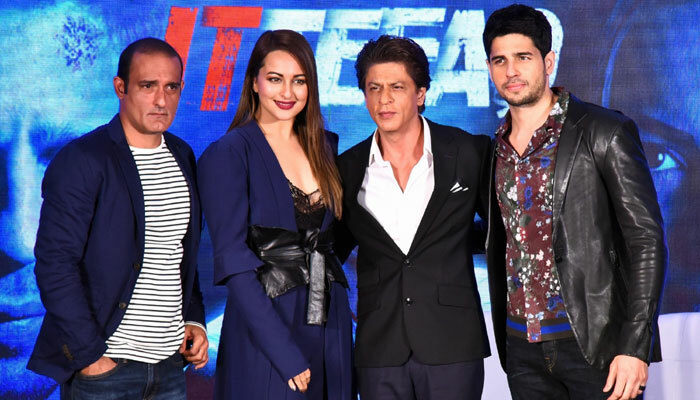 Shah Rukh, who was being his usual witty self, spoke about how he wanted to be a part of Ittefaq but could not due to his busy schedule. However, he feels happy to be a part of it as a producer. Interestingly, the part Shah Rukh Khan wanted to play was the one that Akshaye Khanna has now taken on – the role of a detective in the film. Directed by Abhay Chopra, Ittefaq releases in cinemas this Friday 3rd November 2017. Directed by Abhay Chopra and starring Sonakshi Sinha, Siddharth Malhotra & Akshaye Khanna, Ittefaq releases in cinemas this Friday 3rd November 2017. 16 queries in 0.515 seconds.